​1. Open the app on your iPad. ​2. Select "Sign in With Google" and login using your wps39 email account. If asked, select: "I do not have an invite code" and "I am a student"
​3. To create a new Thinglink, tap on the "+" in the top-right corner. Select "Photo Library" to use a picture that is already saved to your camera roll. 1. Tap anywhere on the picture to add a "Thing." A "Thing" can be either TEXT or MEDIA. If you select "Media" you will have the option to "Take a video", "Take a photo", "Choose from gallery" (aka Camera Roll--pictures/videos) or "Add from YouTube"
​2. Repeat previous step until you have added all of your "Things" to the picture. 3.​ To rearrange the buttons, simply tap the button and drag it to the desired location. 1. Tap on the picture button and then tap on the blue pencil icon. After you have edited the picture, tap the green checkmark to save changes. 2. You will then need to add a title your Thinglink, turn the "Unlist on Thinglink.com" button to the ON POSITION, and then hit "Save"
1. 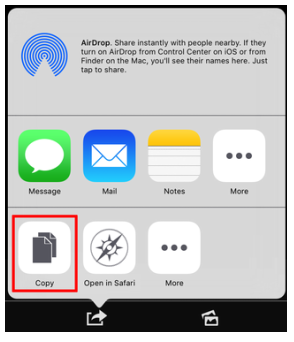 Open the Thinglink you wish to share by tapping on the picture. You should see the following options on the bottom of your screen. Select the "Share" icon. 2. A pop up window will appear. Select "Copy." This option will temporarily copy the URL (website link) for your Thinglink to the clipboard. 3. Open Schoology and find the discussion, assignment, or comment where you would like to paste the link. Hold your finger down on the screen until the "Paste" option appears. Select paste. The URL for your Thinglink should appear in the box.